Our first look at the famous presidential heads of Mount Rushmore came through a tunnel. and iconic symbol of freedom and hope. Perusing brochures we had picked up on our road trip across South Dakota, I discovered that we could arrive at the monument via Iron Mountain Road, a scenic winding road that runs partly through Custer State Park--between Mount Rushmore National Memorial and the junction of US 16A and SD 36. 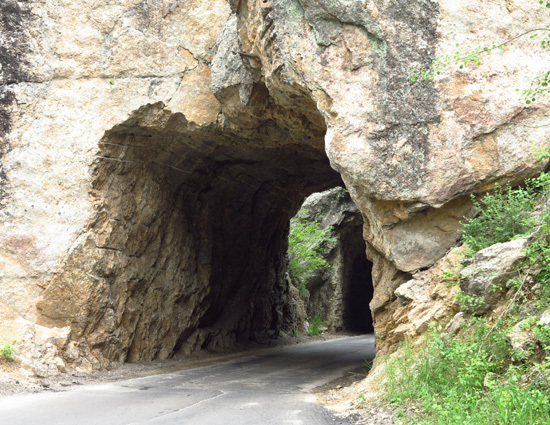 Instead of taking a direct western route, we drove a bit south and then followed 17-mile Iron Mountain Road through hills, meadows, and Black Hills National Forest—marveling at the amount of dynamite needed to blast through solid rock and create three tunnels when the highway was built in 1933. Mount Rushmore views for a distance of several miles. Designed to frame the four presidential faces as they emerged on Mount Rushmore, Iron Mountain Road is a marvel of engineering. 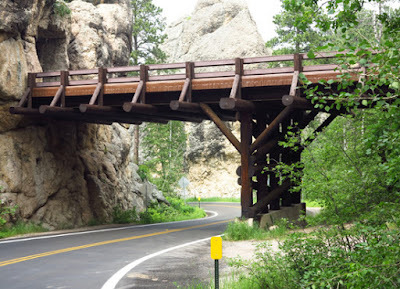 Corkscrew spirals known as pigtail bridges, possible wildlife sightings, and magnificent Black Hills scenery make the hour-long drive worthwhile, even if you’re not heading to Mount Rushmore. Despite the hazy atmosphere (from fires in Canada) I was thrilled at our first glimpse of the National Memorial. 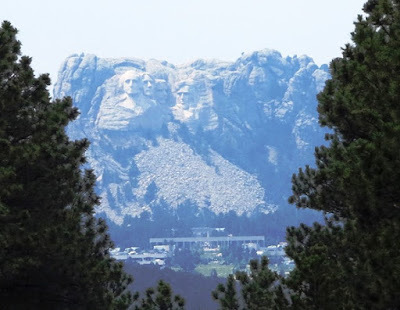 Once through the final tunnel, our views of the gigantic presidents increased with every turn in the road--another two miles to Mount Rushmore. From the time American children are in school, they see pictures of Mount Rushmore. It becomes a familiar sight, yet the enormity of the mountain sculpture is hard to imagine. 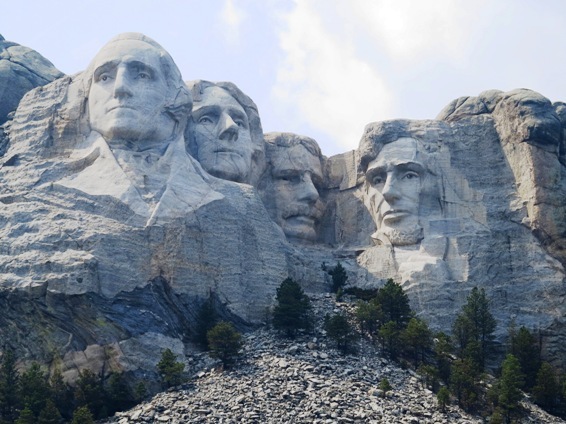 The 60 foot tall faces of George Washington, Thomas Jefferson, Abraham Lincoln, and Theodore Roosevelt were carved into the granite stone of the mountain under the direction of sculptor Gutzon Borglum, as a symbol of American freedom and hope for people from varied cultures and backgrounds. To celebrate our country, the primary walkway is flanked by flags of every state. At the end of the esplanade is a seating area that looks out over the presidential heads. At a staging area below a local band was playing marching music on the day of our visit. We visited the Sculptor’s Studio where Borglum spent much of his time refining his scale model of Mount Rushmore. Then we walked President’s Trail--0.8 mile and 422 stairs long, to get as close and personal with the sculpture as possible. A 14-minute film in the Visitor Center describes the reasons for and methods used in carving Mount Rushmore. Rangers give talks throughout the day, and we learned that the massive task took 14 years and 400 workers to complete at a cost of almost a million dollars. Although Borglum made a plaster mold of each face, he told the artists to feel with their fingers and work from what they felt more than what they saw. We also learned that a 10’ tunnel created behind Lincoln’s head was intended to store historical papers but was never finished. With an erosion rate of one inch every 10,000 years, Mount Rushmore National Memorial should last a really long time. If you can visit in the evening, a spectacular Lighting Ceremony is held nightly from mid-May through the end of September. Even after leaving the Memorial, the views were not over. 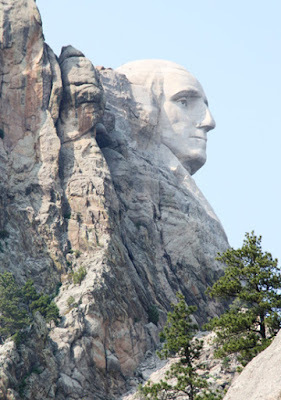 An amazing profile view of George Washington was visible on Hwy 244 as we headed to the town of Custer.